A US Army Heavy Lift Helicopter specification was approved in May 1971 for a 22 tonnes payload class helicopter. 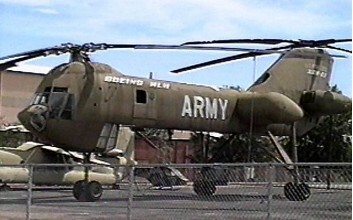 The Boeing XCH-62 / HLH proposal was selected over the Sikorsky S-73 (not built) and the only XCH-62 built (Serial number 73-22012) was put into storage at the US Army Aviation Museum at Fort Rucker Alabama prior to completion when the program was cancelled in October 1974. In 1983, NASA and DARPA (Defence Advanced Research Projects Agency) plans were initiated to resume the test programme but was cancelled again. The Boeing HLH was intentionally destroyed in 2005. According to an aviation museum exec, the HLH was simply a non-flying incomplete proof-of-concept mockup. Since it never achieved flight under its own power, it was not considered as an exhibit.